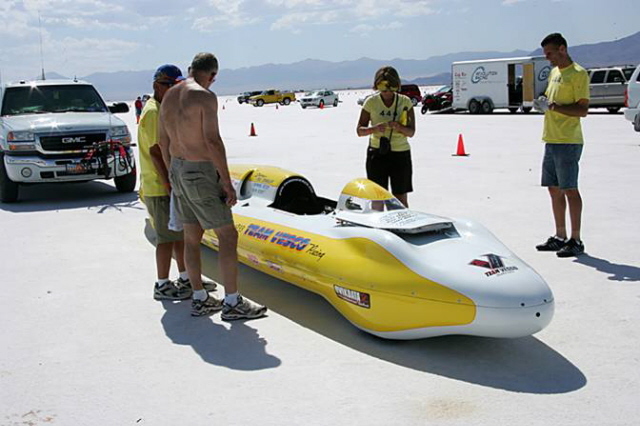 The crowds might be getting smaller, as the 2010 SCTA Bonneville Speedweek moves into the final few days, but the action is only getting hotter. Records have been set and reset, gauntlets have been thrown, engines have been swapped, and that was just Wednesday before lunch. 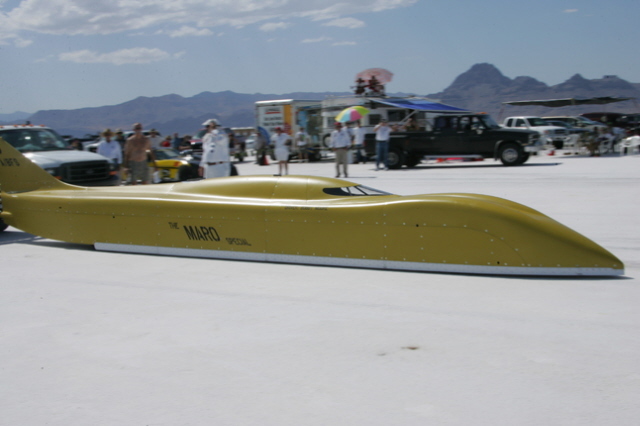 The rest of Speedweek is shaping up to be just as competitive as 2009, with one of the most exciting battles in Streamliner history. 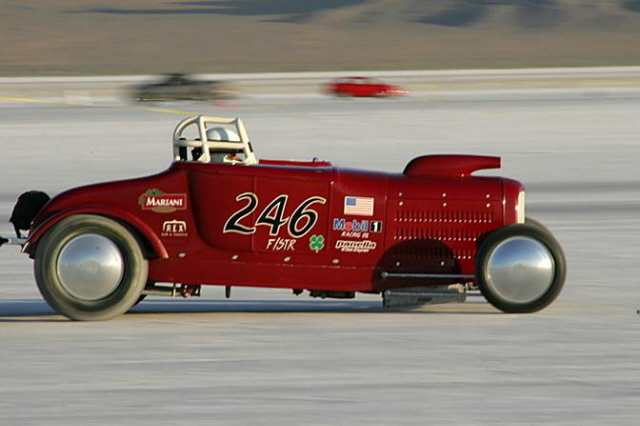 The heavyweights, running only 301 cubic inches, are the team of Ron Main and George Poteet. 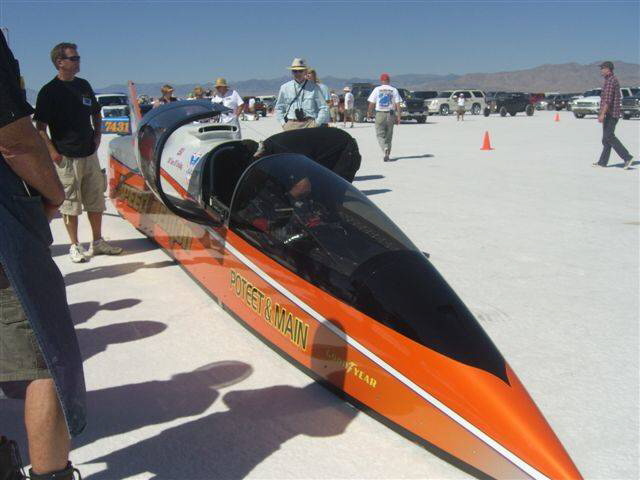 Poteet ran 418 mph on Wednesday afternoon, and we have a video interview about the run below. 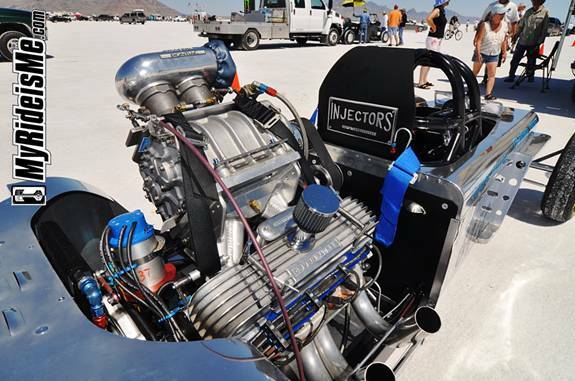 He is determined to get a record over 400 mph, and is determined to take home the Hot Rod Magazine Trophy on Friday. 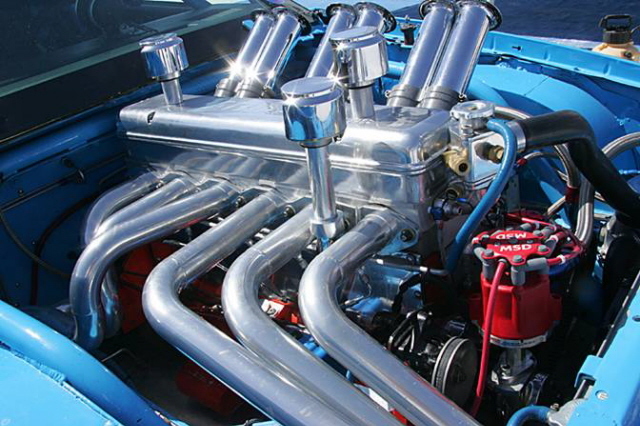 The underdogs, now running 529 cubic inches of turbocharged old school Caddy, are the Spectre Performance gang. 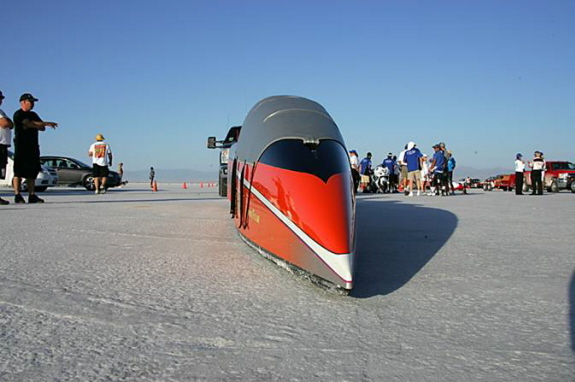 Courtney and the entire Cad Company crew are working hard to keep their powerplant in tip top shape, and are currently in second behind Speed Demon. With two days left, there is nothing more that Spectre would like to see than a run of 400. Is it doable with their combo? We think so. Do you? In other news, driver Jim Kirk is doing well after a serious top end crash in his Z24 Cavalier in the Comp Coupe category. We are working on getting in car footage of the crash and will let you know when we get it. 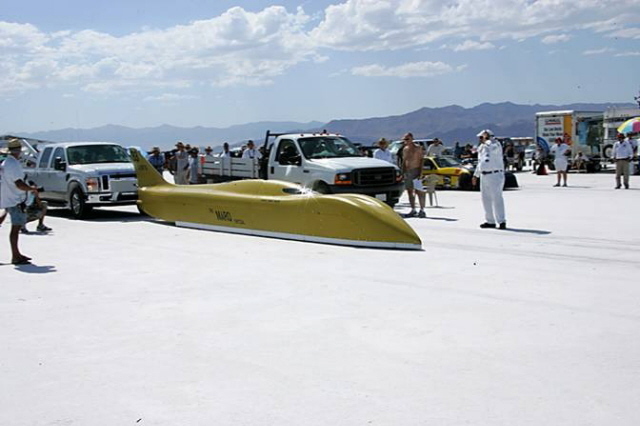 And while there are quite a few folks who get into the Bonneville 200mph club each year, today was special. 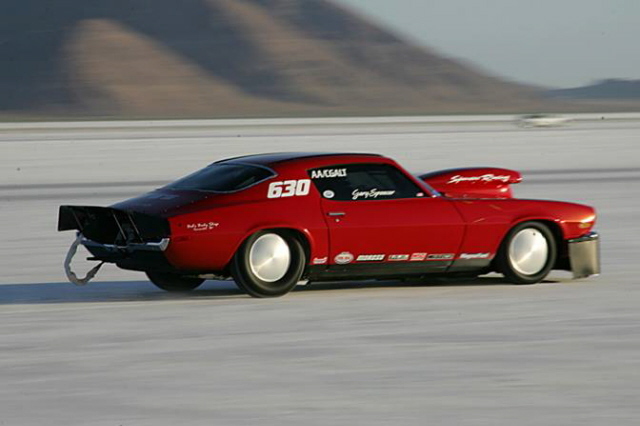 Phil Grissoti, driving the Salty Cuda, finally got into the club and earned his red hat. 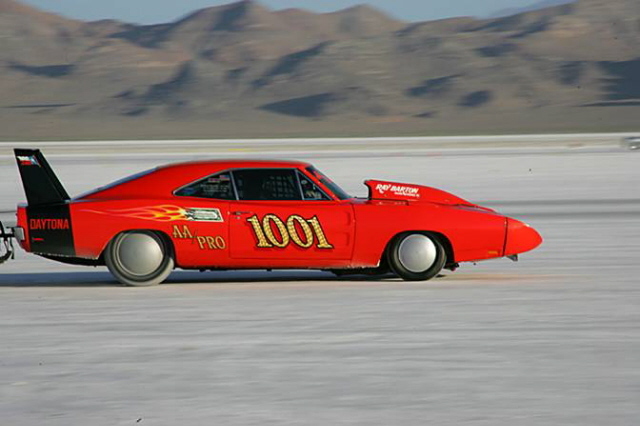 The Salty Cuda team put their first driver into the 200mph club in the mid '70s, and they have been fighting tooth and nail ever since. Major congratulations to all the Salty Cuda gang. We'll be back out on the salt tomorrow morning early to bring you all the days action, including more video. 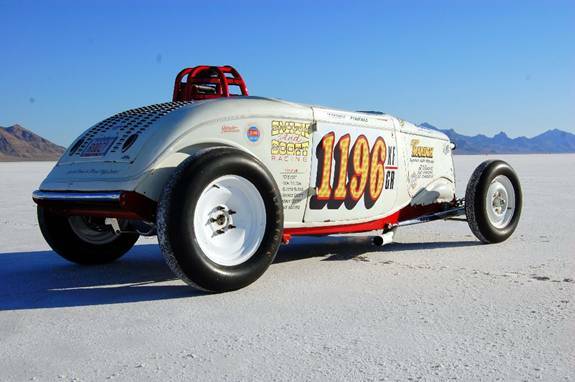 We'll also bring you a complete listing of all records from the 2010 Bonneville Speedweek after racing is completed on Friday. Until then, check out our gallery of photos from Wednesday by clicking here. 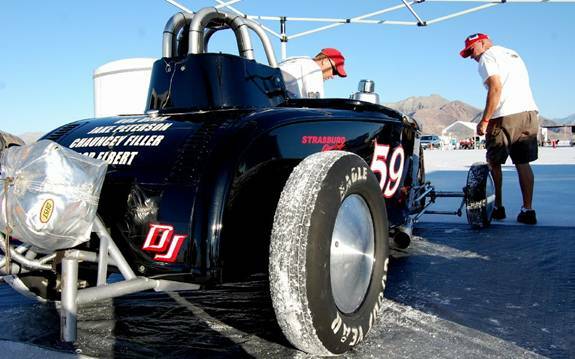 If you missed any of our 2010 coverage of the SCTA Bonneville Speedweek, click here. 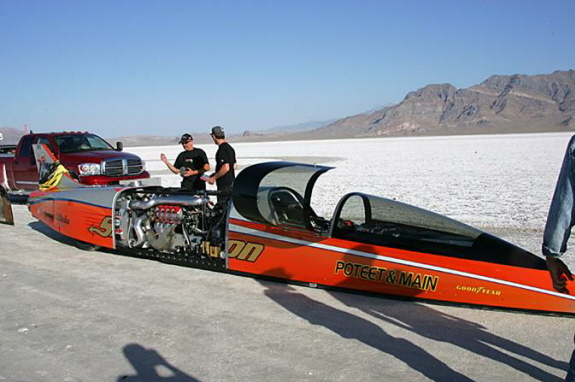 Poteet And Main Speed Demon Runs 417 MPH! Spectre Goes 355! Thanks for coming back! 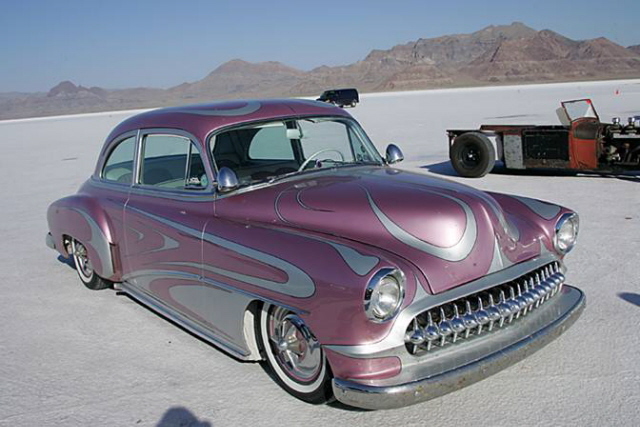 Please subscribe to the Hot Rod, Custom Car & Truck newsletter. This morning begins the first racing day during Speed Week, and I was up with the sun to see what I could find! 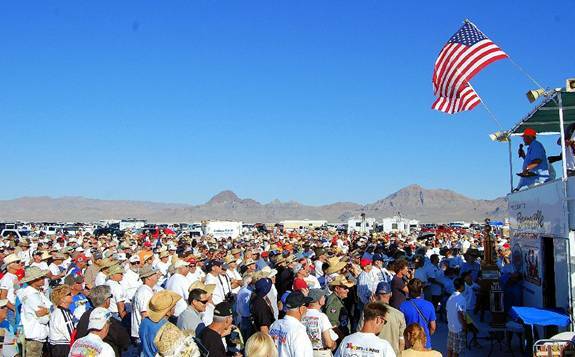 What goes on just before hundreds of racers attempt to set a new land speed record? 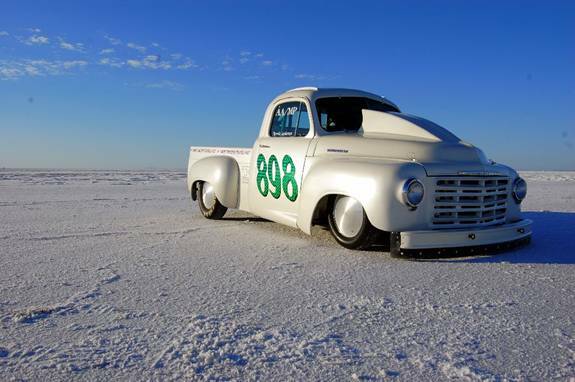 This record-holding 1949 Studebaker pickup is just waiting to make its first run. 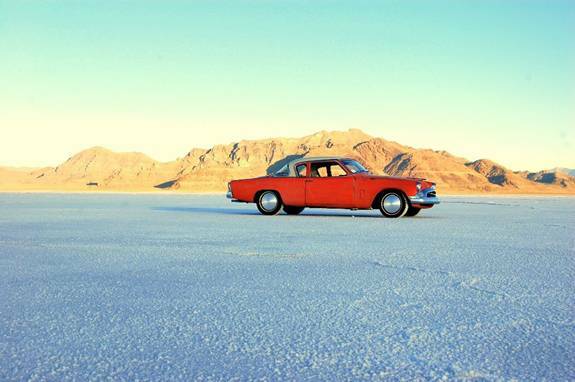 Of course, I couldn’t resist a good photo-op for my 1955 Studebaker’s first voyage onto the salt! The Volk’s were doing some last minute adjustment to their roadster. And a few others were already lined up and ready to race! heads of SCTA and BNI welcomed us. What will the day hold? How many records will be broken? Keep checking back at MyRideisMe.com for more updates! 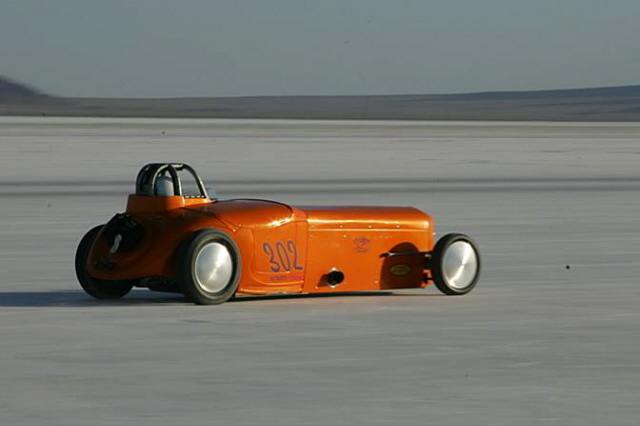 To hold ya over until then, read over all our Bonneville Salt Flat stories here! 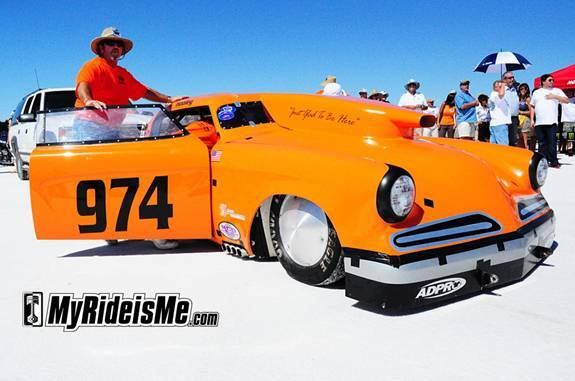 “Just Glad to be Here” is the name of this bad 1953 Studebaker running in B/BGCC or B engine, Blown Gas Competition Coupe and I think owner/driver Loyd Huffman speaks for all of us. Speed Week rocks. 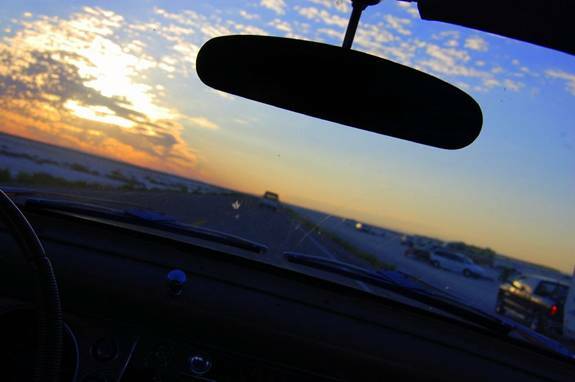 From bright and early, GreaseGirl sped over to the track to catch the good morning light of Sunrise on the Salt Flats. I wasn’t far behind. 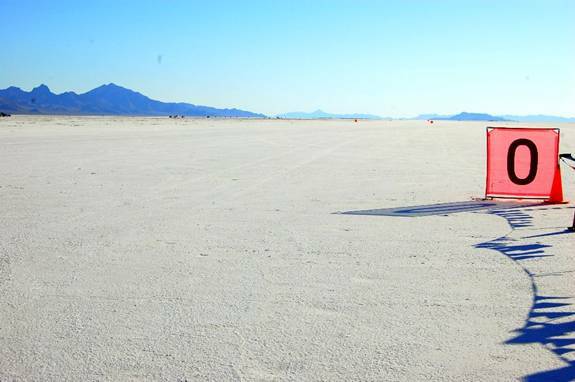 Arriving at the salt I found this sleeping giant of the land speed racing world. 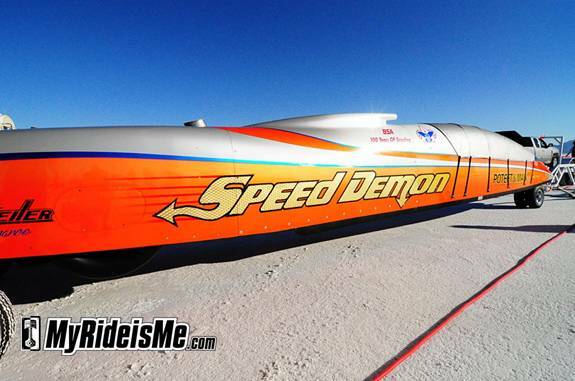 The “Speed Demon” owned by Poteet and Main. 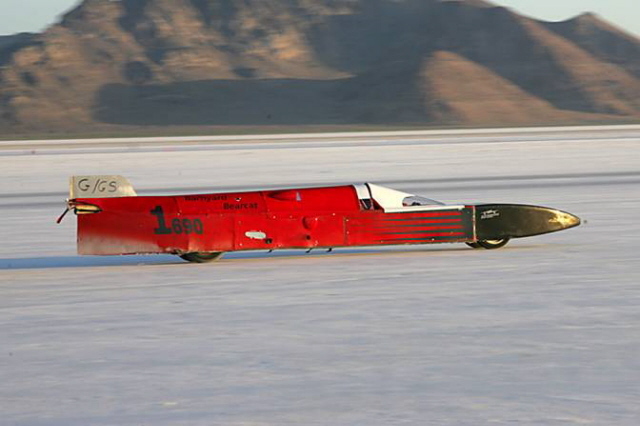 Salt Flat visitors lucky enough to stay all week may see this 299 cu in streamliner run over 400mph. While we’re talking streamliners, take a look inside “The Flower of Scotland”. These guys must have registered late because they’re not in the program. I do know they’re running I/BFS or I engine size, blown fuel streamliner. The I-engine class is only 46-61 cu. in or more likely a motorcycle engine displacing less than 1 litre! How about this! Taking practically the entire alphabet with their race class, VF/CCXF which I think is a 4-cylinder Ford Flathead. It sounded great! Watch for video soon. Don’tcha love these long nosed coupes! I caught this shot over on the “Combination” course. The salt was good enough this year to make the normally “short” (at 5 miles long) course both long and short. 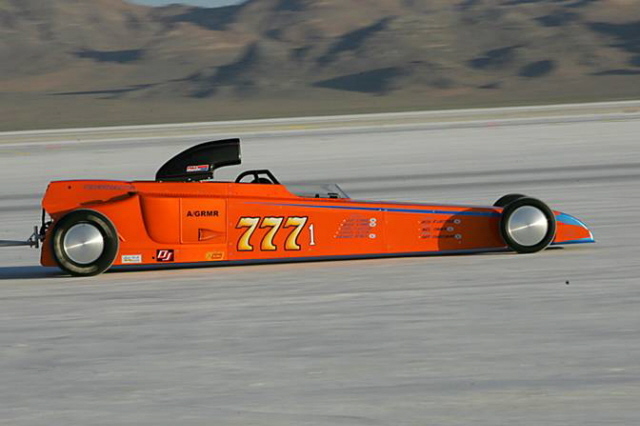 Usually, the long course is only for cars proven to run over 175mph. I listened confused as my new friend and starter Doug Howard kept saying, “Long car” and “Short car”. I thought, “Doug’s loopy from too much sun, this car’s longer than the last one!” But… he was talking about how long the car would run. I caught Doug midway in his “You’re on!” signal. 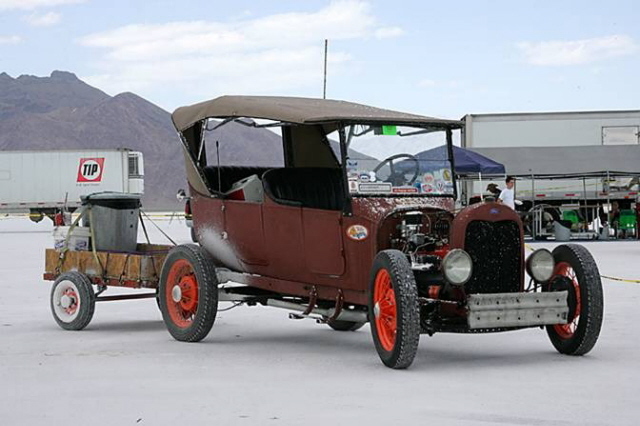 That’s a XO/STR or XO engined (usually inline engines and quite often inline six GMC’s) street roadster shown with Doug. The six’s make a distinct tone not mistaken for a V8. 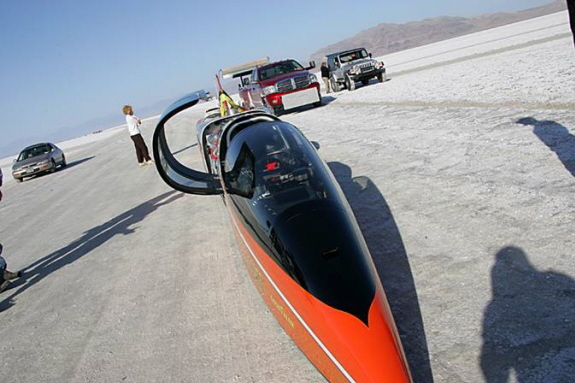 Bajurin and Swansborough own this fine XO example chasing a 153mph record. While we’re talking unusual engines, ever seen one of these? 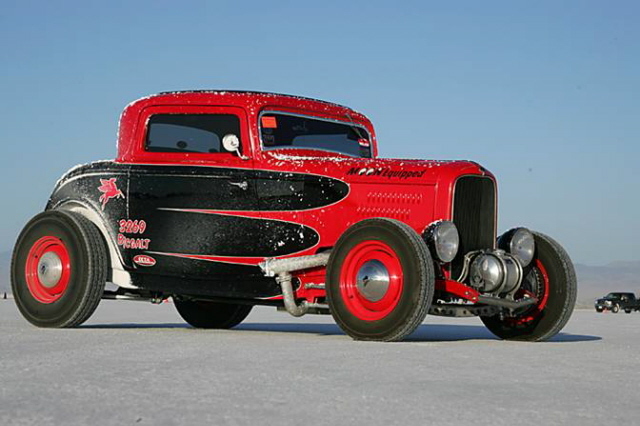 It’s half a Pontiac 389 with a blower thrown on for good measure. 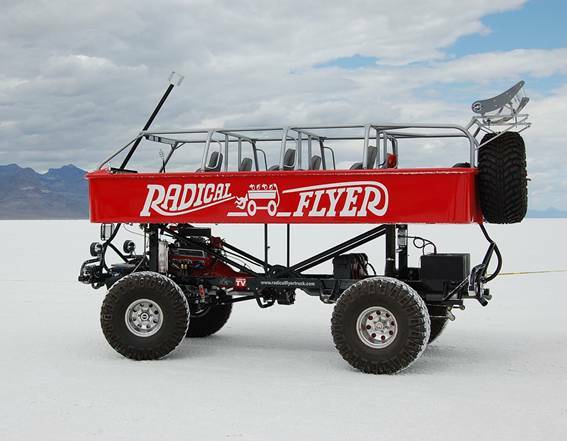 Look for more on this Jeep racer owned by Roger Manson (no relation) of Burnaby, British Colombia very soon. 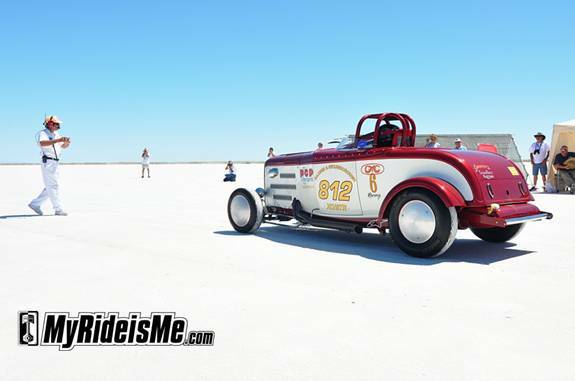 Of course there were hot rods on the salt flats too! 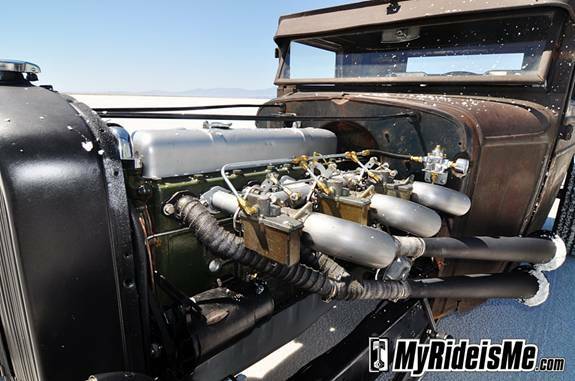 Sticking with the unusual engines, here’s a 270 GMC inline six powering the “Bonnevillians” pickup. 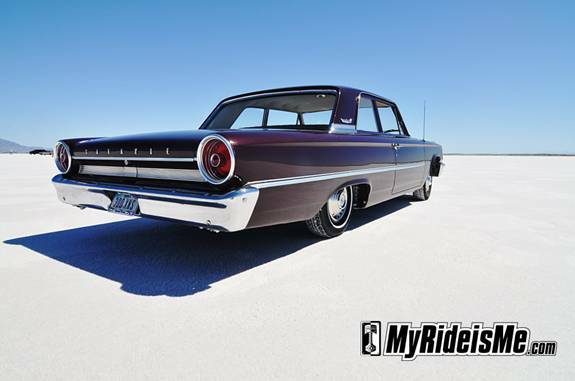 I snuck this gnarly rat rod and this totally sano, one owner 1963 Galaxie off to the side and shot’m up. You’ll have to wait for those pictures, too. 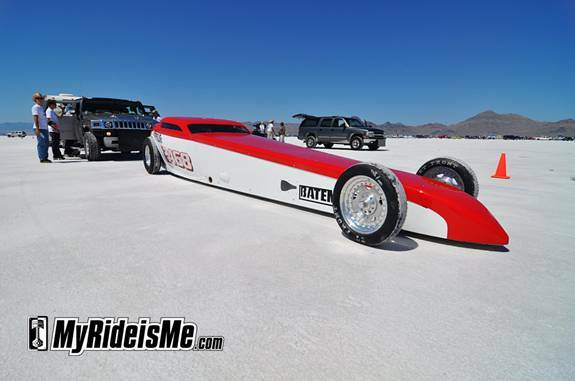 Let me wrap up Saturday’s pictures with 2 rookies to Bonneville salt. This is my buddy Kevin. 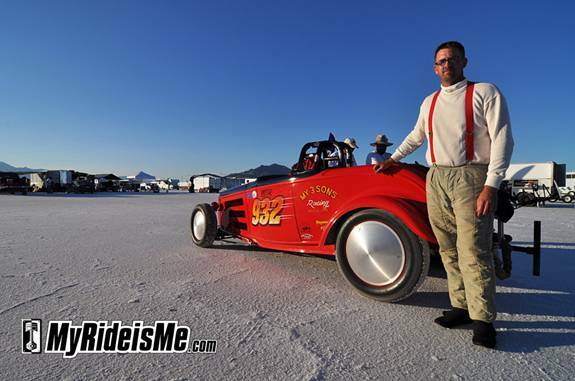 We switched off driving the not-so-nimble MyRideisMe.com RV and “Bonnie” my 1927 Roadster. Kevin’s smile matched the one I saw on the face of David Stranchan when we found the 932 B/STR Street Roadster after making the very last run of the day on the short course. David’s a rookie, the first of the “My 3 Sons” racing team to make a pass and new salt addict after qualifying at 130 mph and change. 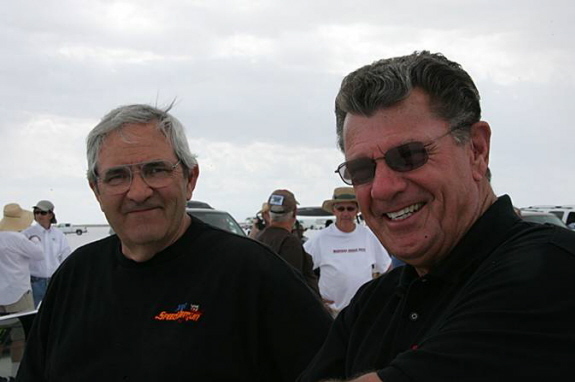 The plan is for dad, Dan and the other two sons, Jeamie and Jeff Strachan to all drive the car this week before returning to Moville, Iowa. Good luck guys! I’ve still got video, and tons more pictures to come. Please check back as we get everything posted as soon as we can. 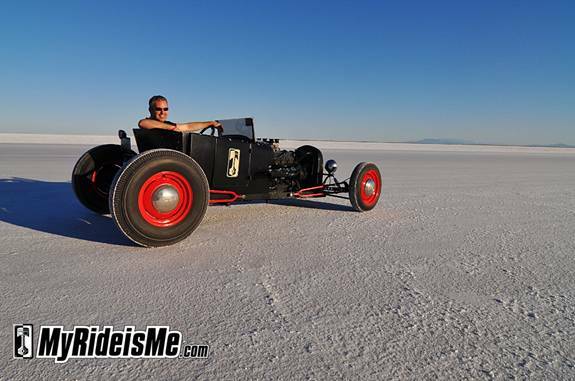 While you wait, check out our Everything Bonneville Salt Flats post.